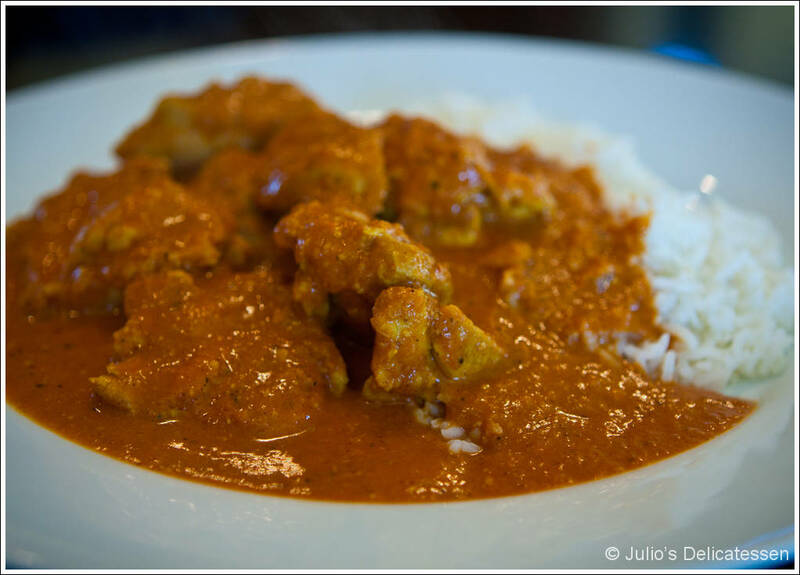 This is a very mild but very tasty dish – great if you’re serving kids or people who aren’t interested in Indian dishes with more spice or heat. Serve with rice, naan, or both. Make the marinade by combining all of the ingredients listed in a large, nonreactive bowl. Add the chicken and toss to coat. Cover and refrigerate for several hours or overnight. Remove the chicken from the marinade. In a large, heavy pot, heat the canola oil over medium-high. Brown the chicken on all sides (working in batches to avoid crowding the pot). When all of the chicken has been browned, add the onions to the pot, stirring to get all of the fond off the bottom. Cook until the onions are soft – about 5 minutes. Add the ginger, garlic, and jalapeno and cook for 2 – 3 minutes. Add the garam masala, cumin, chili powder, cardamom, coriander, salt, and pepper. Stir to combine everything and cook for several minutes until very fragrant. Combine the tomato paste and chicken stock. Add the ground nuts and tomato / stock mixture and bring to a simmer. At this point, you can either use an immersion blender to puree or you can scrape the gravy into a blender jar, blending, and returning to the pot. Stir in the half and half and the butter. When the butter has melted, return the chicken (with any accumulated liquid) to the pot and simmer gently until chicken is cooked through.